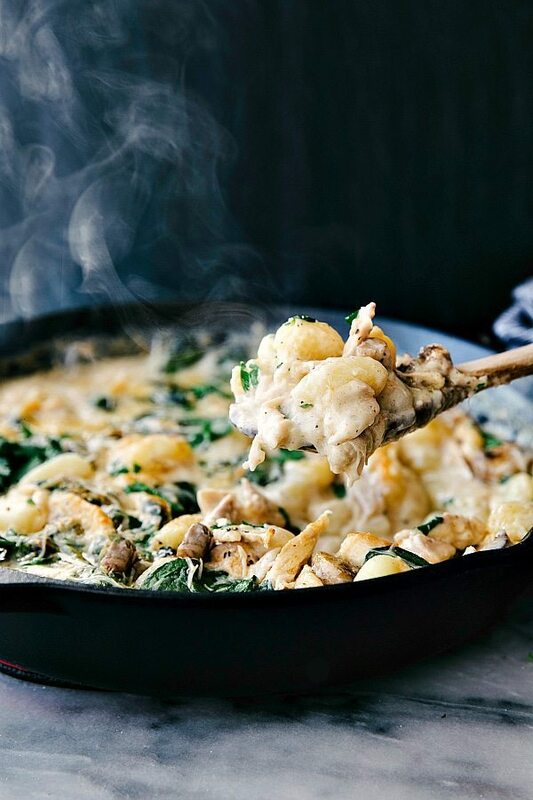 A delicious restaurant quality chicken and spinach gnocchi made all in ONE skillet! Okay so the big question each year (okay not really a “big” question, but stay with me here..) stay in or go out for Valentine’s Day? If you are going out, then you will need this recipe the day AFTER Valentine’s Day and if you are staying in then you need this recipe for Valentine’s Day. ? But really, this is a meal dressed to impress and it’s relatively very low effort. The total hands-on prep time you are looking at about 20 minutes, MAX 25 minutes. This kind of kitchen wizardry does have a slight secret though…and it’s called a rotisserie chicken. Also known as my new favorite way to make a last minute dinner taste like a dinner you’ve slaved over for hours. A sort of bad thing has happened and that is called getting into the habit of buying all the rotisserie chickens, adding my own twist to it, and calling that dinner. And then a couple of weeks ago, I found out that my local grocery store also sells rotisserie chicken meat already chopped up in a nice handy little container. Bad because it comes out to be about $6-7 a pound ?. So it’s not a dinner hack I’ll not use all that often, but it sure is SO nice for busy days when you are in a constant hurry but still want a home-cooked meal. And when all this dinner requires is making a quick homemade cream sauce and then tossing the rotisserie chicken pieces, spinach, and gnocchi in that cream sauce to get baked? Yeah, it sure does feel like the kind of kitchen wizardry I want to repeat every single night! ?? Move a rack in your oven to the upper third of the oven and then preheat to 425 degrees F.
Place a large oven-safe skillet (I use a 12 inch lodge skillet) on the stove over medium-high heat. Pour in the olive oil. Add in the mushrooms and chopped onion and stir until the onion is transparent and mushrooms lightly browned or about 5-6 minutes. Add in the garlic and stir for another 30 seconds. Remove to a small bowl or plate and quickly wipe out the skillet. Place the butter in the skillet and melt. Gradually whisk in the flour until smooth, and continue cooking, whisking constantly for about 3 minutes. Add in the chicken seasoning, about 1/2 teaspoon salt, 1/4 teaspoon pepper, and cayenne pepper if desired. Very gradually whisk in the milk and chicken broth until the mixture is smooth. While whisking constantly allow the mixture to thicken (about 5 minutes). 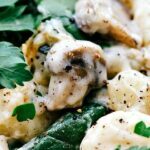 Add in the prepared chicken (remove skin and bones and shred or cut into small pieces OR use prepared rotisserie chicken that has already been cut into pieces), gnocchi (uncooked), cooked mushrooms and onions mixture, and spinach. Stir until all is coated. Top with Parmesan cheese and place in the oven. Bake for 17-22 minutes. If desired, turn on the broiler and then broil for another 2-3 minutes for a delicious crispy top. Remove from the heat, top with additional salt, pepper, and some chopped fresh parsley if desired. Enjoy immediately. This looks positively to die for, Chelsea! I can’t wait to make it, which I will be doing ASAP. I’m sharing on FB and Twitter! Tried this tonight. It was great and very filling. Had to swap out the Mushrooms with Yellow Squash as I’m allergic too Mushrooms. You know what is CRAZY?! I’ve NEVER had gnocci. I know, basically the worst food blogger EVER! But, I’ve been wanting to try it for awhile and this sounds AMAZING girl! Pinned! We’re staying in for Valentine’s, but eating leftovers – romantic, right?! We’ll have to make up for it by making this later in the week. Happy Valentine’s Day! Rotisserie chicken is seriously the most magical and amazing kitchen hack ever! 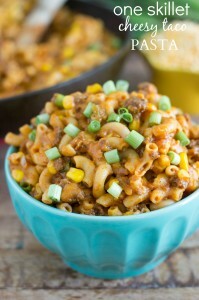 This looks so delicious and would definitely make for the perfect weeknight dinner! Isn’t it though?! Haha! Thank you Ashlyn! Girl this sounds soo delicious!! 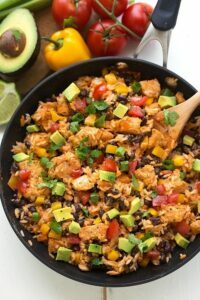 I love when meals can be cooked in one skillet!! Gorgeous pictures as always!! Looks so delicious and you make it seem so easy! Gorgeous photo with the steam:-) Yum! 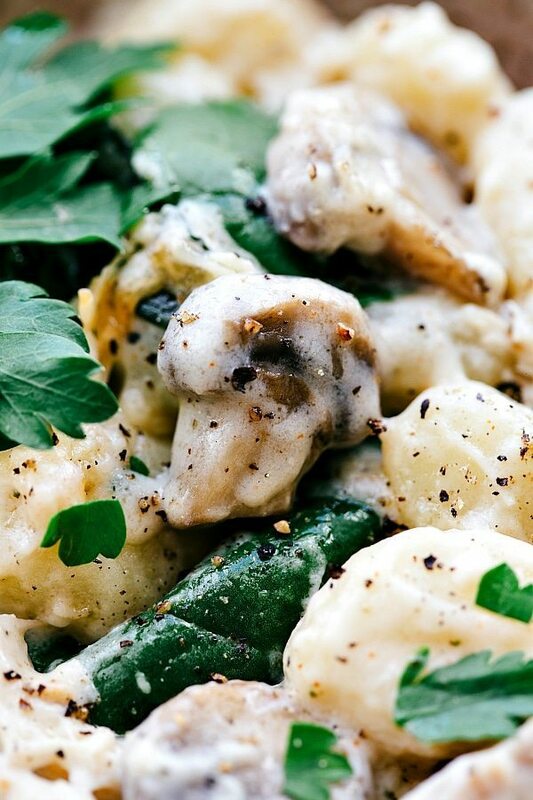 Gnocchi are my absolute favorite, bookmarking this! Can you tell me what you mean by chicken seasoning? Is there a specific brand? That is quite the compliment, thank you so much James!! Our family really enjoyed this dish. Plan to make it many times! Oh my gosh, this has to be the best gnocchi I’ve ever tasted! I’m not even a great cook, I barely started learning. However, I was able to make this without any problem and the outcome was just beautiful. The second I tasted it, I couldn’t stop eating. My taste buds were going crazy because this was just so delicious. Thank you!! Hi. Do you put the mushrooms and onion in when you put in the chicken? Making this as I type- looks and smells amazing! Just an FYI, I’m not seeing where you added back in the onion/mushroom mixture so I just assumed before baking along with all the other ingredients.. hope that’s correct! Yes correct!! I updated the recipe, thank you for pointing that out to me Julie 🙂 Hope you loved it! I made this last night. It was Delicious!!! What kind of gnocchi do you use? I absolutely love gnocchi but haven’t found a store bought brand that I like. Thanks! Made the one pan chicken and lemon asparagus tonight. Wonderful!! So fresh…cant wait to try the gnocchi. My mom came over for dinner this past weekend and I made this for us – she could not stop raving about how amazing it tasted and I could not stop reaching for seconds.. and thirds.. and you get the point 🙂 It was fantastic, super easy to make and full of incredible flavors. I used fresh gnocchi from the refrigerator section at my grocery store and shredded rotisserie chicken.. I’ll be making this again for sure! I’m so thrilled this was a huge hit! 🙂 Thanks so much for the comment Natalie; I always love reading your reviews on so many of my recipes you’ve tried — makes my day! Never made anything with gnocchi before. This was Fabulous. My husband couldn’t quit eating it!! 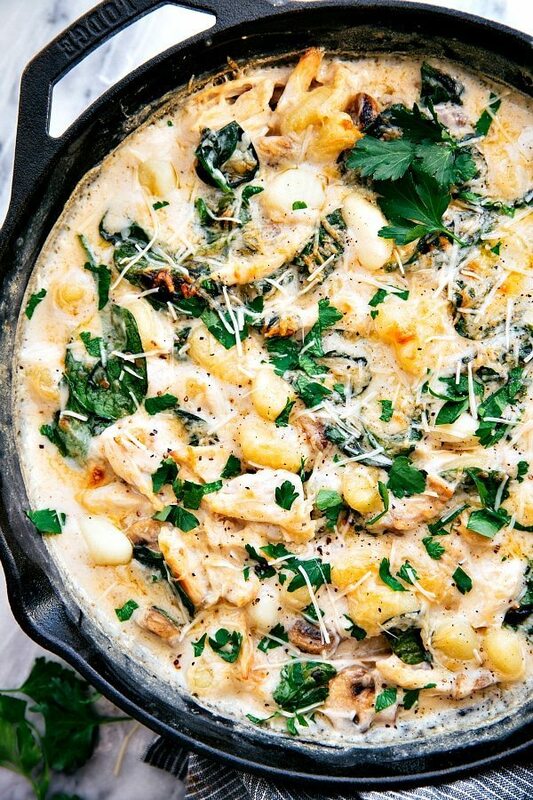 This reminds me a lot of a chicken gnocchi soup recipe I love!!! I cannot wait to try this!!! Had anyone had a side that goes perfectly with this or is it more than enough on its own? Just made this tonight with the help from my son. It was delicious. We did add the cayenne pepper which gave it that nice bit of heat. My family absolutely loved it. Will definitely make this again. This recipe is a keeper! I’m so happy this recipe makes it in the “keeper pile” 🙂 Thanks so much for the comment Michelle! I made this tonight and it was easy and delicious! My husband had 3 helpings and the first three bites he took he said this is really good after each one. I will make this again and again. Thanks for posting! Julie! This makes me so happy! Glad you and your husband enjoyed! It’s definitely one of our favorites too! This was tonight’s dinner. Chelsea, this was fabulous and I thank you. You all need to make this! Like a rustic Tuscan dinner. Delish! I used 1/8 teaspoon of cayenne and it was perfect. I also used refrigerated gnocchi vs. shelf stuff. And I let it sit for 10 minutes before serving. It thickened up perfectly. This is restaurant quality, for sure. Will make again. Definitely. This looks delicious and I hope to make it tonight. I don’t have an oven safe skillet however. DO you think I’ll get the same results if I just transfer the mixture to a casserole dish after i mix everything together? Amazing dish. Made this for my family tonight. My husband is a chef and i am always trying to impress him. We all really wnjoyed this and he was impressed. He said really Pintrest.? Haha!! So great to hear you were able to impress your husband with a Pinterest recipe 😉 Thanks so much for the comment Cat! 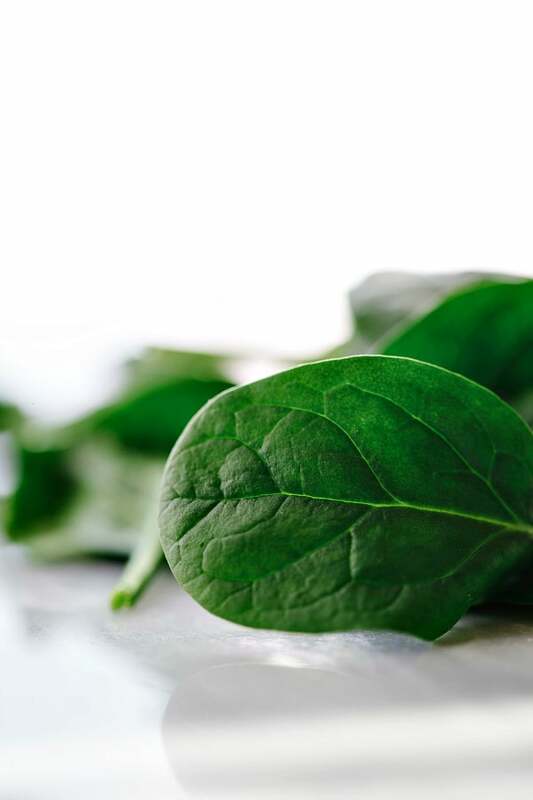 Can frozen spinach be used? I’d recommend fresh in this dish. I keep coming back to this one! Every time I make it it comes out perfectly. This is amazing and can’t wait to make it, now!!! ? Quick question… Can I use buttermilk instead of the butter and flour mixture? Will be as creamy as your recipe? If so, how much would you recommend? This was delicious! My husband raved about how good it was. 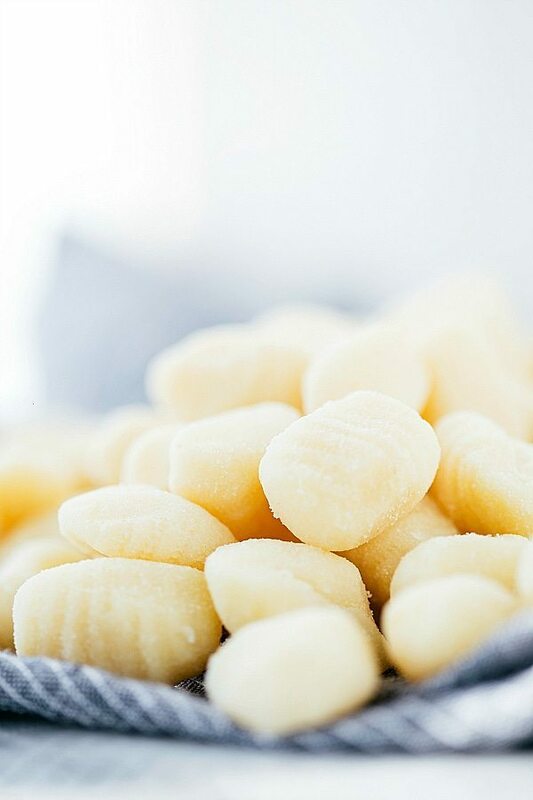 I make my own ricotta gnocchi and freeze them and I’m always looking for new ways to use them. Thank you for sharing this recipe, i know I’ll be making it again. Thank you for the chicken seasoning recipe too, I had all the ingredients so I whipped that up too. It really gives it all the flavor. So happy to hear this was a hit! 🙂 Thanks for the comment Maryanne! This was so easy and quick. I found this and decided to use up a bunch of leftovers. The remains of last nights chicken and a package of spinach, left over cream that I used with skim milk, bouillon cube instead of broth, gnocchi in the pantry waiting to find a use, canned mushrooms. It still tasted great and I didn’t have any appropriate cheese to substitute. I also used a dutch oven as I had no oven safe skillet. I will definitely make this again as it is SO flexible with what you have on hand. I made this for dinner last week and I loved it! Hubby and I don’t like mushrooms, so I left them out and I simmered it on the stove instead of baking it. Still delicious! Thanks for the great recipe! I made this tonight and it was delicious! Instead of using a rotisserie chicken, I cooked two chicken breasts in my Instant Pot, which made broth in the bottom of the pot that I used in place of the chicken stock. I also forgot to saute the garlic with the onions and mushrooms, but added it to the roux. Turned out great and will be added to our recipe rotation. Thank you! Absolutely delicious! I also used a rotisserie chicken. My hubby & I both loved it. Thank YOU so much for sharing this recipe. It was “the maiden voyage” in my new cast iron skillet.